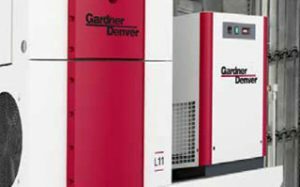 Gardner Denver offers its enhanced LRS-Series 90-132kW variable speed rotary screw compressors featuring a color touchscreen controller and more voltage options. The controller is a 7” color touchscreen that can sequence up to 8 compressors and has an easy-to-access schematic view of system health. This series of variable speed rotary screw compressors are also available with 575V configurations. Also, an improved control panel design delivers a simpler installation, start-up and servicing of the compressor package. Lastly, an improved baffle design is much lighter and smaller than the previous version and allows for increased compressor portability and access to the motor.